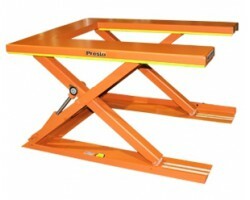 Presto Lifts UL32-22 Roll-in U-Lift Lift Table can be fed with a hand pallet truck. 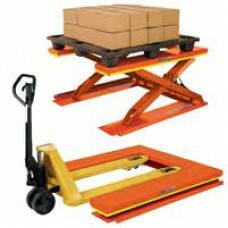 Pallet truck forks roll into the platform while the pallet moves over the outside platform beams. Workers have access to all four sides of the pallet. For use with open bottom pallets only. ♦  Load capacity: 2,200 pounds. ♦  Platform size: 48" x 53". ♦  Lifting speed: 22 seconds. ♦  Standard 1 HP motor. ♦  Full perimeter toe guard. ♦  Operates on standard 115V power. ♦  Raised Height: 31-1/2" and 3-1/8" lowered height. ♦  Shipping weight: 700 pounds. 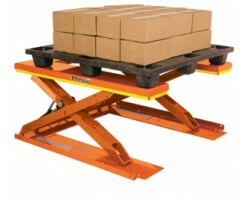 The U-Lift Roll-In Lift Table has been designed for feeding and offloading with an ordinary hand pallet truck. 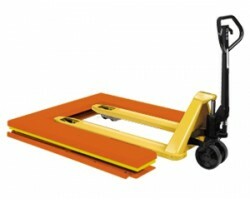 With a pallet truck in the fully raised position, the load can be placed on the lift. 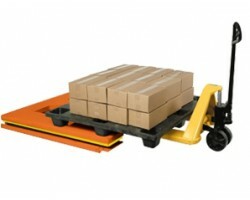 The pallet rides over the outside platform beams while the pallet truck fits in between them. This unique design gives workers 4-sided access to the loads with minimal to no reach-over. An electromechanical toe guard around the perimeter of the platform protects workers. Standard footswitch control. ♦ Full perimeter toe guard. ♦ Operates on standard 115V power. ♦ Raised Height: 31-1/2" and 3-1/8" lowered height. ♦ Load capacity: 2,200 pounds. ♦ Platform size: 48" x 53". ♦ Lifting speed: 22 seconds. ♦ Standard 1 HP motor. ♦ Shipping weight: 700 pounds. 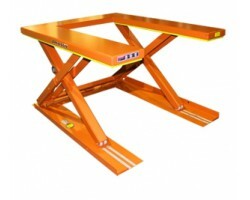 Presto Lifts UL32-22 Roll-in U-Lift Lift Table added to your Quote list!